One of the key factors when setting up training programs quickly and efficiently for your clients is the ability to enter the acute variables of sets, reps, time, tempo, rest and intensity very quickly and easily. Our personal trainer software makes this extremely easy and unbelievably fast. Here's a quick demo of how you do it. To set the acute variables for an individual exercise, click on the exercise, and it takes you in to do it exercise by exercise. You can scroll on through to make it very fast, then go on to the next exercise. Using the tab button on your keyboard means you never need to break or pause to enter all of the variables in your program. If you don't want to set any variables you can of-course leave those boxes blank. Once you're happy with all of the acute variables you put in click on apply. To save an incredible amount of time you can add an entire section's worth of acute variables at the same time. 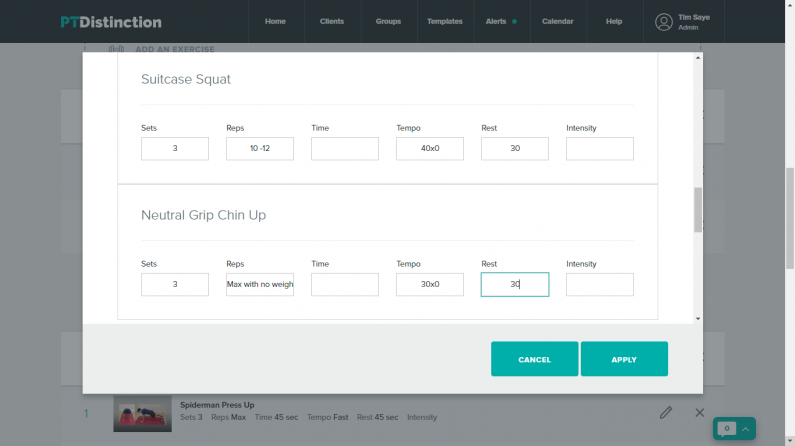 To do this click the button by your section name and enter any of sets, reps, tempo, time, rest, and intensity that you want to set for your clients. This will then populate them for every exercise inside that section. If you want to change variables for any of the individual exercises, just click on that exercise and you can change anything you like. As you can see it's very, very fast to add sets, reps, tempo, time, rest and intensity to your workouts on PT Distinction, give yourself maximum flexibility and save a lot of time when creating programs for your clients. If you're not already a member and you want to save a huge amount of time with your program design you can grab a free month here.